Although dill is used all over the world it is quite often associated with Eastern European and Russian cooking. The famous beetroot soup, borsht, is flavoured with dill as are numerous Russian salads. In Sweden dill is one of the main flavours used when making the cured salmon dish gravlax. I would also consider dill to be a vital ingredient in cabbage rolls and in the Greek yoghurt dip tzatziki. Dill is apparently easy to grow though we have had little success with it in our container garden. It always seems to ‘bolt’ before it has time to form any useful amount of foliage. Mum has more success in her country garden but since I haven’t been down there for a while and dill is best fresh I ended up buying some from my local fruit and vegetable supplier who has lovely, lush bunches of fresh herbs for a couple of dollars. 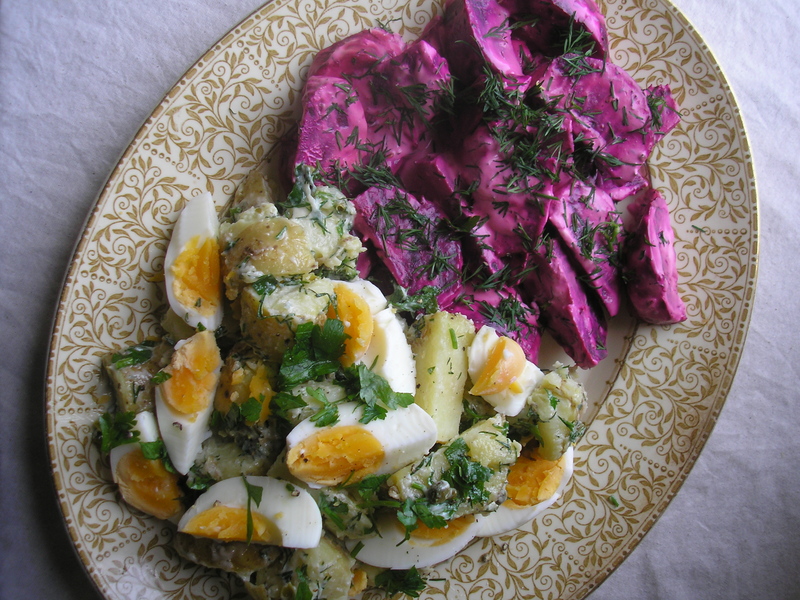 With it I made what I call my borsht salad and a delicious and very filling potato salad made with kipfler potatoes. Wrap beetroot in foil and bake in a moderate oven for 1 – 1 1/2 hours or until tender when pierced with a skewer. Allow the beetroot to cool then peel using a pair of tongs to hold the beetroot and a sharp knife. Cut each beetroot into 8 wedges and place in a large bowl. Season and dress with the lemon juice and the oil. Add dill, nutmeg and sour cream. Toss well. Fill a pot with cold water and place the scrubbed but not peeled kipfler potatoes in the pot. Bring to the boil. Reduce heat and simmer for 15-20 mins or until tender. Drain and while still warm, slice and place in a large bowl. Dress with the lemon juice and olive oil, season and allow to cool completely. Add dill, parsley, capers and mayonnaise. Toss well. Arrange the sliced hard boiled eggs on top and sprinkle on some more chopped dill and parsley. Another good dish for those who want a quick, simple meal is san choy bao. This minced meat dish has Chinese flavours combined with the textural contrast of crunchy water chestnuts and the iceberg lettuce leaf in which it is served. 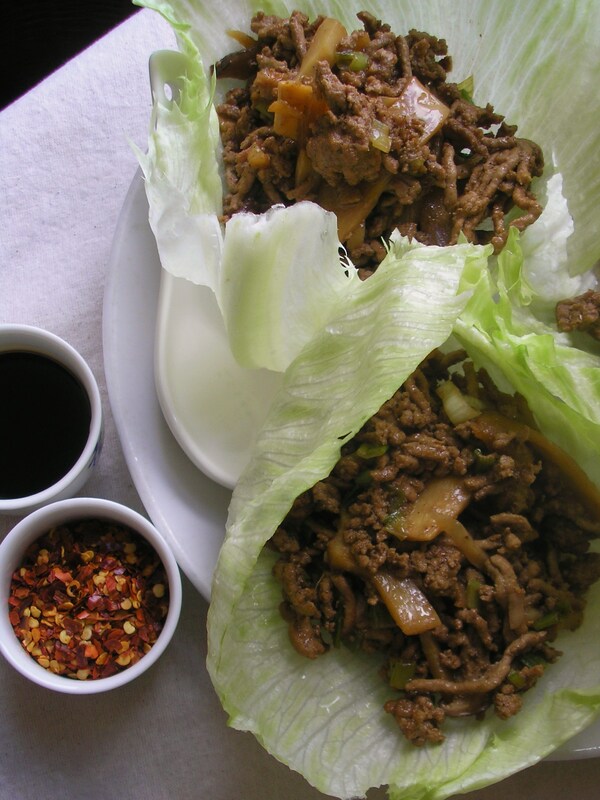 It is eaten with the hands – a bit like a healthier Chinese version of the hamburger. Wrap it up in the lettuce leaf and eat it over a plate! Heat oil in a wok, add mince and fry gently until browned and all moisture has evaporated. Meanwhile, mix together the soy sauce, rice wine, black vinegar, sesame oil and five spice powder in a bowl. Add the ginger, garlic, spring onions and mushrooms and fry gently until aromatic. Add a little of the mushroom soaking water if it is drying out too much. Add the bamboo shoots and water chestnuts, then the soy sauce mixture. Reduce for a minute or two. Serve in iceberg lettuce cups. Add a handful of bean shoots on top of the mince for even more textural contrast.